here is what the mri of my back looks like. 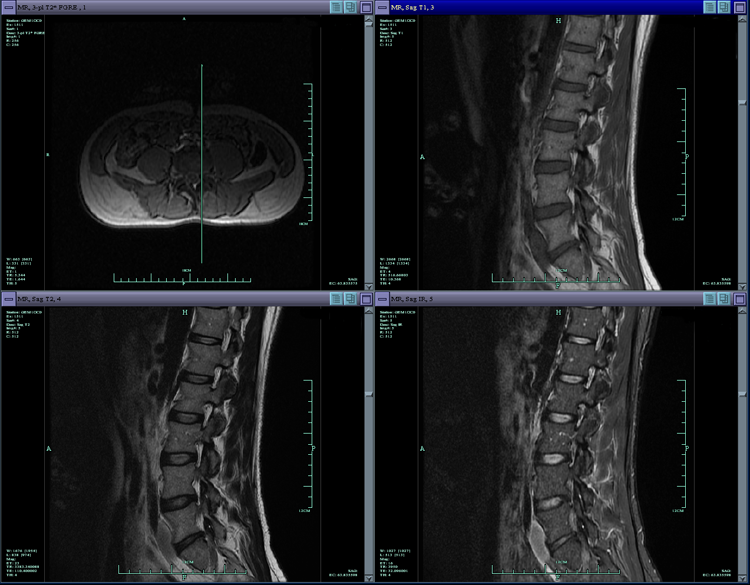 although i can’t really tell where they are…there are not 1, not 2, but 3 disc herniations. so…for what it’s worth, to anyone that didnt really think the wincing and ugly faces i was making [when i trying to deal with certain things (like putting on socks/shoes and getting into/out of cars)] were for real, well…you can all suk it. i’m not sure i used the  and () correctly but i enjoyed trying. Posted on Thursday, August 18th, 2011 at 12:31 pm. Filed under: f-u, pain RSS 2.0 feed.